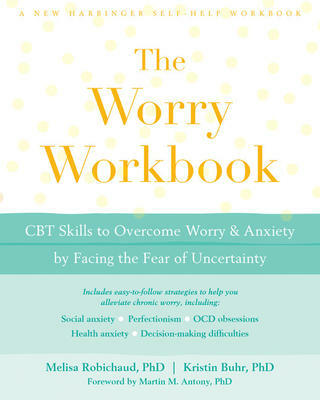 Written by two psychologists and experts in anxiety,The Worry Workbook provides powerful, evidence-based tips and tools to help you challenge your fears, build a tolerance for uncertainty, and find relief from worry. Everyone worries from time to time—it’s unavoidable. But chronic worrying, anxiety, and fear can also take a hefty toll on your health, happiness, and relationships. If you’re someone who worries about whatmight happen if you try something new, you aren’t alone! Many people lose sleep over “what ifs”—leading to difficulty making decisions, avoiding new situations, trouble with relationships, and missing out on life’s adventures! So, how can you overcome this fear and start living your best life? While there are many self-help books and workbooks that tackle worry and anxiety,The Worry Workbook is the first to provide guidance for overcoming the fear of uncertainty. With this guide, you’ll find concrete exercises and step-by-step instructions to help you identify your fear of uncertainty—whatever it is—and challenge it using powerful cognitive behavioral therapy (CBT) practices like self-assessment, self-monitoring, and behavioral experiments. Melisa Robichaud, PhD, is a clinical psychologist and cofounder of the Vancouver CBT Centre. She holds adjunct clinical faculty and clinical associate positions in psychology and psychiatry at the University of British Columbia and Simon Fraser University. Robichaud specializes in the treatment of anxiety with an emphasis on generalized anxiety disorder (GAD), and is on the scientific advisory board of AnxietyBC. For over a decade, she has provided workshops and training to both mental health professionals and the public on the treatment of GAD, and has published numerous book chapters and scientific articles on the subject. Kristin Buhr, PhD, is a registered psychologist and director at the North Shore Stress and Anxiety Clinic in North Vancouver, BC. She is a lead consultant for AnxietyBC, where she has developed numerous self-help resources for adults, parents, and teens coping with worry and anxiety, includingMindShift, an anxiety management app for youth and young adults. Buhr specializes in the evidence-based treatment of anxiety and mood disorders in adolescents and adults, and regularly provides educational workshops on mental health issues.